A 56-year-old woman with a 50-plus pack-year smoking history was diagnosed with stage II (T2N0M0) squamous cell carcinoma of the right true vocal cord and was initially treated with radiation therapy alone consisting of 70 Gy in 35 fractions to the larynx, along with elective treatment of bilateral levels II, III, and IV lymph nodes. After 15 months, the patient developed locally recurrent disease involving the right anterior vocal cord and underwent a total laryngectomy with bilateral neck dissection, right thyroid lobectomy, pectoral flap graft and tracheostomy. Nine months following surgical salvage, the patient developed an isolated local recurrence involving a left level III lymph node. She was treated with salvage stereotactic ablative radiation therapy (SABR) to a dose of 44 Gy in 5 fractions (Figure 1) along with concurrent and adjuvant cetuximab and docetaxel as part of an institutional protocol for patients with recurrent head and neck squamous cell carcinoma (NCT02057107).1 The patient reported the expected acute toxicities consisting of grade 1 fatigue, acneiform rash, mucositis, and as first reported here, a new late toxicity consisting of a left-sided miosis, ptosis, and facial anhidrosis (Figure 2) 6 months following the completion of salvage SABR. The patient remains disease-free > 24 months following salvage re-irradiation with no additional late toxicity. A preoperative positron emission tomography/computed tomography (PET/CT) scan demonstrated a hypermetabolic lesion of the left level 3 lymph node, which measured 3.5 × 2.1 cm (Figure 1). There was no additional evidence of regional or systemic disease. Pathology from laryngectomy and neck dissection demonstrated ulcerated, invasive squamous cell carcinoma. Biopsy of the suspected lymph node recurrence by ultrasound-guided fine-needle aspiration was positive for malignant squamous cells. The treatment of head and neck squamous cell carcinoma (HNSCC) often requires a multimodal approach including definitive concurrent chemoradiation or surgical resection with adjuvant radiation with or without chemotherapy. Despite these aggressive approaches, locoregional recurrence rates can be as high as 30% to 35%.2-4 Salvage surgical resection is the preferred treatment following recurrence;5 however, this approach can be limited for various reasons including disease involvement of critical structures such as the carotid artery. In patients with unresectable locoregional recurrences of HNSCC, SABR has emerged as a viable curative treatment approach. Its success is largely due to the ability to deliver highly conformal radiation at a high dose per fraction to disease sites with improved sparing of normal tissue. The use of reirradiation with SABR has been associated with favorable toxicity rates ranging from 4% to 11% acute, and 3% to 19% late grade ≥ 3 toxicity, most commonly mucositis, xerostomia, dysphagia and edema.6-9 The treatment regimen used in this patient of 44 Gy in 5 fractions with concurrent cetuximab in particular has been demonstrated to be both safe and effective, with progression-free survival of 33%, and acute and late grade 3 toxicity rates of 6%.9 Per the protocol under which this patient was treated (NCT02057107), dose to normal tissues and sensitive head and neck structures, such as the carotid and spinal cord, should be limited. Cumulative dose to the spinal cord is not to exceed 50 Gy.1 Dose to the sympathetic trunk is not generally calculated or constrained during treatment planning. While not used during treatment planning, maximum and mean dose to the carotid was determined to be 53 Gy and 32 Gy, respectively. Regarding our patient who underwent salvage SABR with prior radiation, treatment has led to sustained local control with no evidence of recurrent disease. 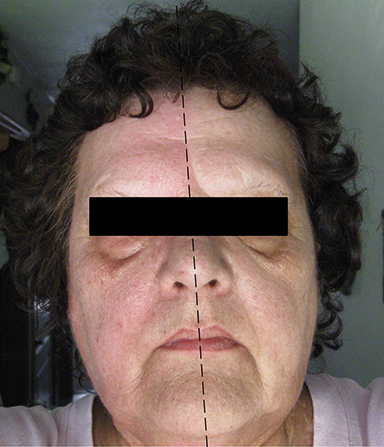 Interestingly, she developed left-sided ipsilateral ptosis, miosis and anhidrosis of her face, which was appreciated 6 months after treatment. In our institution’s extensive experience with SABR with concurrent and adjuvant docetaxel and cetuximab for previously irradiated HNSCC, this is the first case of Horner’s syndrome suspected as a treatment-related toxicity. This complication possibly reflects this patient’s multimodality treatment including reirradiation with SABR along with systemic therapy. Her treatment was focused at the level III nodal location, with treatment overlap of the sympathetic nerve fibers of either the 2nd order neuron or the distal portion of the 3rd order postganglionic neuron (Figure 1C). In our literature review, we were unable to identify a prior report of Horner’s Syndrome occurring as a result of reirradiation with SABR. Horner’s Syndrome presents classically with unilateral miosis, ptosis and anhidrosis of varying severity due to disruption of sympathetic output to the ipsilateral face. Causes vary based on the location of the neuron involved, and include compression from tumors, CNS lesions, trauma, and iatrogenic causes.10 While Horner’s Syndrome can result from radiation-induced brachial plexopathy following treatment for lung and breast tumors, it is a rare toxicity and is more often associated with mass effect from the neoplasm itself.11 Other radiation-induced neuropathies from radiation therapy to the head and neck include cranial nerve palsies of both upper and lower cranial nerves, none of which include Horner’s Syndrome as their presenting symptoms.12 The lack of other neurological symptoms in our patient makes radiation-induced damage to the cervical chain the most likely diagnosis. In ruling out other causes of new-onset Horner’s Syndrome in this patient, the most recent head-and-neck PET/CT reveals no malignancy within the sympathetic pathway. Recent medical history includes no trauma that could explain the patient’s symptoms. Surgical resection of her first recurrence is unlikely to have damaged her sympathetic chain, considering that symptoms of Horner’s Syndrome weren’t noted following surgery, but appeared 6 months after subsequent salvage SABR treatment. However, it is possible that post-surgical scarring following the patient’s laryngectomy could partially contribute to her symptoms. To date, there are no reports of the development of Horner’s Syndrome as a result of salvage SABR after prior radiation therapy for HNSCC. SABR has been reported to have a relatively favorable toxicity profile compared to reirradiation with fractionated radiation therapy; however, as SABR for recurrent HNSCC increases in utilization, and survivors are followed, it is imperative to maintain close follow-up and report toxicities accordingly. University of Pittsburgh. Randomized Phase II Trial of Stereotactic Body Radiation Therapy (inoma of the Head and Neck (SCCHN). In: ClinicalTrials.gov. Bethesda (MD): National Library of Medicine (US). 2000. https://clinicaltrials.gov/ct2/show/NCT02057107?term=NCT02057107&rank=1 NLM Identifier: NCT02057107. Accessed October 24, 2016.
Cooper JS, Zhang Q, Pajak TF, et al. Long-term follow-up of the RTOG9501/intergroup phase III trial: postoperative concurrent radiation therapy and chemotherapy in high-risk squamous cell carcinoma of the head & neck. Int J Radiat Oncol Biol Phys. 2012;84(5):1198-1205.
larynx in patients with locally advanced larynx cancer. J Clin Oncol. 2013;31(7):845-852. Trotti A, Zhang Q, Bentzen SM, et al. Randomized trial of hyperfractionation versus conventional fractionation in T2 squamous cell carcinoma of the vocal cord (RTOG 9512). Int J Radiat Oncol Biol Phys. 2014;89(5):958-963. McDonald MW, Lawson J, Garg MK, et al. ACR appropriateness criteria retreatment of recurrent head and neck cancer after prior definitive radiation expert panel on radiation oncology-head and neck cancer. Int J Radiat Oncol Biol Phys. 2011;80(5):1292-1298. Diane CL, Vargo JA, Ferris RL, et al. Risk of severe toxicity in patients treated with stereotactic body radiation therapy for recurrent head and neck cancer. Int J Radiat Oncol Biol Phys. 2016;95(3):973-980. Heron DE, Rwigema J, Gibson MK, et al. 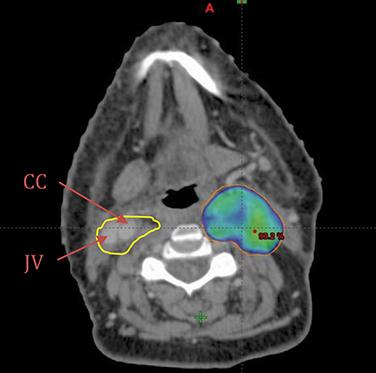 Concurrent cetuximab with stereotactic body radiotherapy for recurrent squamous cell carcinoma of the head and neck: a single institution matched case-control study. Am J Clin Oncol. 2011;34(2):165-172. Rwigema J, Heron DE, Ferris RL, et al. 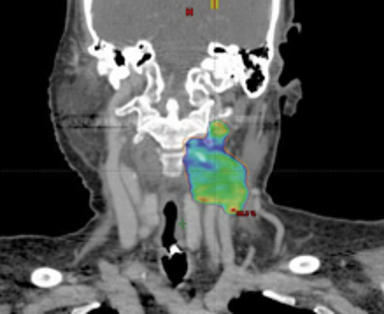 The impact of tumor volume and radiotherapy dose on outcome in previously irradiated recurrent squamous cell carcinoma of the head and neck treated with stereotactic body radiation therapy. Am J Clin Oncol. 2011;34(4):372-379. Vargo JA, Ferris RL, Ohr J, et al. 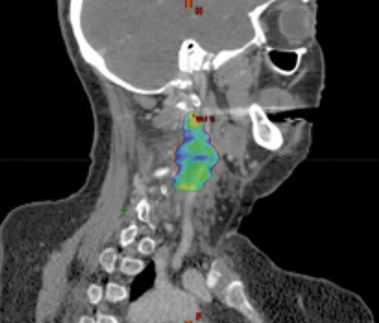 A prospective phase 2 trial of reirradiation with stereotactic body radiation therapy plus cetuximab in patients with previously irradiated recurrent squamous cell carcinoma of the head and neck. Int J Radiat Oncol Biol Phys. 2015;91(3):480-488. Gross JR, McClelland CM, Lee MS. An approach to anisocoria. Curr Opin Opthalmol. 2016;27(6):486-492. Jaeckle KA. Neurological manifestations of neoplastic and radiation-induced plexopathies. Semin Neurol. 2004;24(4):385-393. Rong X, Tang Y, Chen M, Lu K, Peng Y. Radiation-induced cranial neuropathy in patients with nasopharyngeal carcinoma: a follow-up study. Strahlenther Onkol. 2012;188:282-286. Hatheway CM, Holt DE, Gebhardt BJ, Heron DE, Ohr JP, Ferris RL, Clump DA. Horner’s Syndrome following salvage stereotactic ablative radiation therapy (SABR) for recurrent laryngeal carcinoma with prior . Appl Rad Oncol. 2017;6(2):26-28. Mr. Hatheway is an MSIII at the University of Pittsburgh School of Medicine, Pittsburgh, PA. Dr. Holt is a PGY1 in the Department of Internal Medicine, University of Utah School of Medicine, Salt Lake City. Dr. Gebhardt is a PGY4 in the Department of Radiation Oncology, University of Pittsburgh Cancer Institute, Pittsburgh, PA. Dr. Heron is director of radiation services at UPMC Cancer Center, chairman of the Department of Radiation Oncology, and professor of the Departments of Otolaryngology and Head and Neck Surgery at UPMC Shadyside, Pittsburgh, PA. Dr. Ohr is an assistant clinical professor of medicine at the University of Pittsburgh School of Medicine, Pittsburgh, PA. Dr. Ferris is chief of the Division of Head and Neck Surgery at the University of Pittsburgh School of Medicine Department of Radiation Oncology, Pittsburgh, PA. Dr. Clump is an attending radiation oncologist at University of Pittsburgh Cancer Institute (UPCI), Pittsburgh, PA.